Hobart is home to the Antarctic Gateway Partnership whose research program involves the employment of forty young researchers and technicians working with senior scientists at the largest Southern Hemisphere Antarctic and oceans research hub. The Antarctic Gateway Partners are the University of Tasmania-Institute for Marine and Antarctic Studies (IMAS), CSIRO and the Australian Antarctic Division. 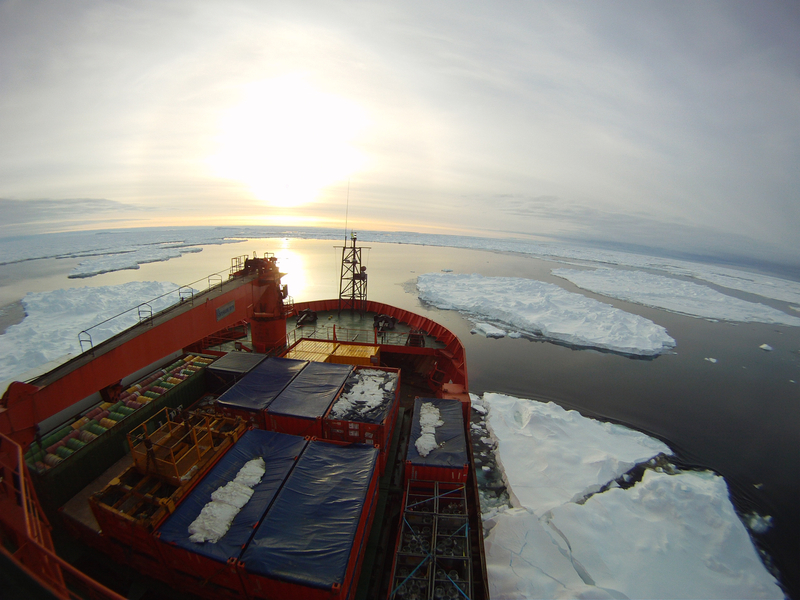 The Gateway Partnership works closely with the Antarctic Climate and Ecosystems Cooperative Research Centre the Integrated Marine Observing System and the Southern Ocean Observing System. Read the full science narrative below. Listen in on the Composer and the Scientists in conversation about Movement 2 – the phytoplankton. What do I see when I look to the blue horizon? There is only one answer – LIFE! I’m going to tell you the story of our oceans. Not the water you see lapping at the coastline, perhaps blurring past your car window as you go driving along. I am guessing that is what you think of as the ocean – that body of water that clings to our shoreline. What we see from our window is just the beginning. The true ocean lies over the blue horizon; it lies a long way from land; it is the vast expanse of water that stretches as far as you can see and beyond. I’m going to share with you my thoughts and perspectives on our oceans – and perhaps raise questions about its future too. You see, I am an Oceanographer, and in many ways the ocean is my home. Life originated in the water more than 3.5 billion years ago and has been bound to it ever since. The early forms of life were bacteria and small organisms called Protists, and these still inhabit our oceans today. These early life forms began producing oxygen in the oceans. This oxygen passed out of the oceans into the atmosphere, and slowly, over millions of years, built up until it created the stable oxygenated air we happily breath today. These tiny oxygen producing microbes ever so slowly colonized the land, and eventually evolved into the plants and trees we see, and use, all around us today. Through the slow process of evolution, it wasn’t until 200,000 years ago that anatomically modern humans appeared. What few of us modern humans appreciate is that the oceans, the origin of life, keep our air fresh and our environment habitable: and in fact, we depend on them for life. The ocean covers around 71% of the planet’s surface. The ocean connects all things. It is the thread that binds the web of life together. “Without the global ocean there would be no life on Earth”. The deep, interconnected oceans are massive – massive in every sense of the word. They’re so massively deep that their most secret depths have not seen the light of day for thousands of years. In the past, centuries were required for events occurring on the surface to reach down and touch the oceans’ interior. The oceans move heat around the planet like a giant conveyor belt. The major circulation of the world’s oceans is driven by the temperature difference between our tropical equator and the frozen poles. In the northern Hemisphere as warm water approaches the cold Arctic Ocean it cools and begins to sink, forming a cold dense packet of water called bottom water. This cold water then flows back South towards the equator where it is warmed and rises up close to the surface – This is a form of upwelling, as we call it. As this now warm water flows northward again its heat warms the atmosphere above it and the land it travels beside on its journey back to the Arctic. This ocean circulation pattern has the result of increasing the temperatures of the regions near to these currents and allows people like you and me to live in areas that would otherwise be bitterly cold. In the southern hemisphere, the vast Antarctic Circumpolar Current carries about 150million cubic meters of water every second from the West to the East right below Australia. It is the largest current in the world and is unbroken by land. This circumpolar current connects the Indian, Pacific, and Atlantic Oceans as it travels around the globe. This unbroken connection drives global ocean circulation patterns and is key in regulating global climate. The Southern Ocean is unique in the world. It is all the water south of 30oS. With its particular currents and ecosystems, the Southern Ocean is able to store more heat and CO2 than any other latitude band on earth. 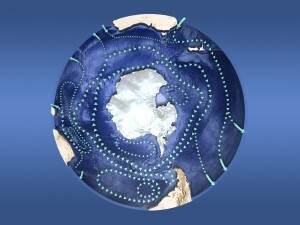 Through the connectivity of the Antarctic Circumpolar Current the Southern Ocean influences 40% of all ocean circulation and isolates the Antarctic from the rest of the world. It is the only place on the globe where deep ocean water – water that is normally at a depth of 3 or 4 thousand meters in the rest of the world – rises all the way up to the surface. It’s the only place where the atmosphere has a direct connection to the deep ocean. This connection allows a direct pathway for things happening at the sea surface to pass into the deep ocean and has a lot to do with how much CO2 remains in the atmosphere in this region. The Antarctic Bottom Water is a component of what we call the Southern Ocean overturning circulation. This is the very cold dense water that pushes northward and drives that great ocean conveyor belt that we talked about before – the one that feeds the upwelling and the productive regions of the world oceans – regions like much of the Australian coastline, some mid Pacific hot spots, and the productive west coast of South America, to just mention a few. The differing densities of seawater found in the Southern Ocean, drive the overturning circulation pattern that takes warm, and oxygen rich, water from the surface down deep into the abyss. Density is linked to temperature and salinity. In order to comprehend overturning circulation, you only need to understand one core principle: basically, if a packet of ocean is dense (that is very salty and/or cold) it will sink more readily than a less dense (that is less salty or warmer) packet; this sinking creates movement and eventually ocean circulation. Temperature and salinity are important drivers of our oceans and are at the core of how our oceans physically move and work. The temperature of the Earth is regulated by the balance between the energy coming in to the Earth from the sun, and the energy radiating back out into space – imagine the warmth of a brick wall on a summer’s eve: how it returns the heat it absorbed during the day back to the air around it during the night. Our earth is much like this wall but with a blanket on it that traps some of the heat. The earth’s atmosphere provides this blanket of gas that traps just the right amount of heat energy in and blocks out the sun’s harmful energy, like damaging U.V. radiation. Earth’s atmosphere is made up of lots of gases but the two key components of the gas blanket are CO2 and CH4: Carbon Dioxide and Methane. Phyto = plant like, Plankton = drifter. If the ocean forms the thread that connects all the systems, then the phytoplankton is the fundamental fabric of the whole system. Much of what we rely on everyday comes from the activities of phytoplankton, most of which are occurring on time scales of milliseconds to days, and at sizes smaller than the thickness of a human hair. Phytoplankton influence almost every part of our lives, from the air we breathe, to the petrol in our cars, and the rocks we use to build our homes, along with many others. They trigger cloud formation, shielding the earth from the sun’s rays, they are essential to the global cycle of carbon on our planet. They even generate the smell of the sea! Phytoplankton are the direct ancestors of those first microbes who formed our oxygen rich atmosphere using an early form of photosynthesis. Phytoplankton are so numerous that they account for over half of all photosynthesis on earth – as much as all the trees and plants and grass on the land all put together. Incredible. Let’s remember that photosynthesis is the process of using sunlight to make organic material from raw chemicals (known as carbon fixation), of which oxygen is a key by-product. Phytoplankton is where the process of photosynthesis began and every second breath of oxygen you take has come from and is thanks to these tiny microscopic organisms. Being planktonic they are at the mercy of the currents, but many plankton use this drifting process to move vast distances around the globe. It’s common for larger organisms, such as fish, to begin their life feeding in the rich plankton, using drifting as a method of dispersal or travel. Phytoplankton also form food for many small grazing animals like pteropods and krill, which are then preyed upon on by other larger marine life all the way up the food chain. Eventually the energy that the phytoplankton captured with the help of the sun is transferred to us. We breathe the oxygen the Phytoplankton produce. We eat the fish the phytoplankton feed. We run our cars on the fossilized remains of their dead bodies: did you know that much of the oil we use today comes from the decomposed remains of prehistoric plankton that fell to the seabed of ancient oceans? We even build our houses with calcium carbonate cement derived from the chalk skeletons of particular a phytoplankton: the coccolithophores. Our life undeniably relies on the phytoplankton that drifts passively throughout all the water of our big blue planet. Earth’s climate is regulated by incoming energy from the Sun, energy from the Earth’s interior, and energy radiated into space. Prof Mike Coffin, Executive Director, IMAS. Before we move on you need to understand that there is natural variation in our earth and that it’s climate has been dancing to its own tune since long before we decided to start fiddling with things. The world’s oceans have seen hot and cold temperatures over the last 4.5 billion years. The last high CO2 period gradually developed over millions of years. We see this very clearly in the Antarctic ice core record, but the high CO2 period we’re developing now has happened in only the last hundred years or so. This is a much more rapid change than our climate is used to, so much so that it’s changing the ocean’s chemistry faster than we’ve ever seen before. Since the onset of the industrial revolution the atmospheric concentrations of CH4 and CO2 have been rising, and rising increasingly rapidly, effectively making our atmospheric gas blanket thicker. This has warmed the surface of the earth and that means it has also warmed the oceans that cover more than 70% of the earth’s surface. What has the ocean done with all this extra heat and CO2 we’ve been pumping out over the last hundred years or so? It is shifting the balance of things to meet the challenges we have, and still are, throwing at it. Here I’m going to talk about the Southern Ocean in particular. Ocean warming Since the industrial revolution there have been significant changes. Within two generations the Southern Ocean has acidified, warmed, freshened (that is become less salty), the circulation patterns have changed, and its unique ecosystems have shifted. All of this is in response to the increased CO2 levels in our atmosphere, which is a direct result of our burning of fossil fuels. “About 90% of the extra heat energy that’s been storied by the earth’s systems in the last 50 years is in the ocean. So when we talk about global warming we’re really talking about ocean warming.” (Steve Rintoul reference) In the Southern Ocean we’re already seeing changes to the interior of the ocean. The Antarctic Circumpolar Current has already warmed by half a degree all the way down to almost a kilometer below the waves. How long until this warming reaches the abyss? And what will be the consequences for us all? The warming of the Southern Ocean is having an alarming feedback effect as it reaches the far south and begins to wash underneath the Antarctic sea ice and ice shelves. The warming surface waters increase ice melt rates and lead to faster freshening, and therefore changes in ocean circulation. This melting also contributes significantly to global sea level rise. It is estimated that if the entire Antarctic ice sheet melted sea level would rise by 60m. The Southern Ocean has freshened as well as warmed. It is becoming less dense. From what we know about overturning and ocean circulation this freshening could slow the Southern Ocean overturning and stop the transport of heat and oxygen to the depths. This outcome is potentially catastrophic for the organisms that rely on the circulation to bring nutrients up from the seafloor and, in turn, take oxygen down to the bottom. Since the 1970’s there has been a 60% reduction in the volume of the deep bottom currents that leave Antarctica and drive the world’s great currents. Turn off the overturning and the oceans become stratified, potentially developing into a stagnant soup. Warming is not the only challenge we’re bringing the world’s oceans. All that additional CO2 doesn’t just stay up in the air where we put it, in fact only half of the CO2 released by human activity has remained in the atmosphere. Of the remainder, about 20% has been taken up by the terrestrial biosphere – that is all living organisms on land – with the oceans having taken up the other 30%. The Southern Ocean alone contains approximately 40% of all the human induced CO2 that is currently in the global oceans. Without this oceanic uptake, CO2 concentrations in the atmosphere would be much greater and our gas blanket much thicker: the oceans are reducing the severity of global warming. However, this uptake of CO2 is making the oceans more acidic (lowering their pH). The surface waters of the ocean have decreased by 0.1 pH units since the start of the industrial revolution, which equates to roughly a 25% decrease in H+ (Hydrogen) ions. Now, a 0.1 or a 25% decrease might not seem like much to you and I, but to the little critters that live in this Hydrogen soup it’s a huge shift to adapt to in such a brief period of time. For the many marine organisms out there like coccolithophores – remember we talked about them earlier – sea snails, corals, foraminifera and thousands of other important food chain species that create calcium carbonate shells and structures, it has suddenly become a struggle to keep their ‘bits’ from dissolving. A quote I’d like you to consider here is “imagine no more shell in Shellfish”. That’s where we’re heading. The thinner shells and reduced calcification currently being observed in the Southern Ocean and the world’s coral reefs, may affect both the organisms ability to survive, resulting in ecosystem shifts, and their ability to export/sequester carbon to the deep ocean through the sinking of their remains. In the long term, this impacts on the formation of future fossil fuels. “It is important to understand that the greenhouse gases we are producing now will take a couple of decades to produce the changes they are destined to make within the oceans. This delayed reaction is due to the inertia of the oceans, both thermal and chemical: we call this Commitment. The term means the commitment of the Earth now to paths of change that will be unavoidable and unstoppable in the future.” The former Chief Scientist of the Australian Institute of Marine Science, Doctor Charlie Veron believes Ocean Acidification is destined to be one of the biggest issues humanity has ever faced. And for me the most urgent question we need to investigate is just how quickly can the oceans adapt to the rapid transformations we’ve caused in the last 50-100 years? How fast and how far can we push the oceans before they can no longer keep up? As an oceanographer I want to know how this is all going to play out now we’ve interfered with these processes – we’ve effectively grabbed the wheel of the bus and stepped on the gas. All life evolves through time. Oceans are not static: they are always evolving; always changing. Our human civilization evolves too, and most strikingly, our use of industrial technology has evolved more in the last 100 years than at any other time. These advances have been coupled with a dramatic increase in the world’s population; recently we clocked over 6.9 billion people on earth. I find this number almost incomprehensible and I struggle with the concept of almost 7 billion individuals living on only 29% of the earth’s surface. The needs, desires and aspirations of such a mass mean that the consumption of natural resources is at an all-time high, and is rapidly rising. When considering evolution, it is important to remember that the evolution of ecosystems occurs at a variety of timeframes. The apex predators – humans, whales and seals – reproduce slowly, requiring centuries to evolve and adjust to the challenges present in their environment. Whereas, the smallest organisms – the microbes to whom we owe so much – are rapid adapters to new trends; they, therefore, form the very foundation of all the world’s ecosystems. For example, given the right conditions an entire new generation of phytoplankton is created every day. This rapid turn over allows more opportunities for adaptation to occur than most other organisms experience in a decade. Now, this is an encouraging thought. Life originated in the ocean. It evolved alongside our climate system and its recent adaptation shows me that their evolution will continue. The physics will play out, the gas will flow through, and the Phytoplankton will evolve. What do I see when I look out at the blue horizon? Robert Johnsona and Nicholas Rodena,b, PhD Candidates. (a) Institute for Marine & Antarctic Studies, University of Tasmania, (b) Commonwealth Scientific and Industrial Research Organization’s Centre for Marine and Atmospheric Research, Hobart, Tasmania, Australia. With thanks to A/Prof Peter Strutton, IMAS and Dr Guy Williams, ACE CRC. Editor: Sue Anderson, Lynchpin. Hear Professor Mike Coffin introduce the Institute for Marine and Antarctic Studies (IMAS) at UTAS (Hobart, Tasmania), outline the Institute’s background, global context, opportunities for students, and plans for the future. An aspect of the 2013 collaboration is to try to encourage a wider concept of our planet earth and the extraordinary and vital role played by the oceans. Our intension is to work from the iconic image of the Blue Planet spinning in outer space and move down to the ocean surface and beneath, using NASA footage to give a sense of just how vast is this 71% of the earth’s surface covered by oceans. This perspective is foreign to most of us. Those who experience space travel come to know something else, something which is literally ‘other wordly’, and are changed by the experience. 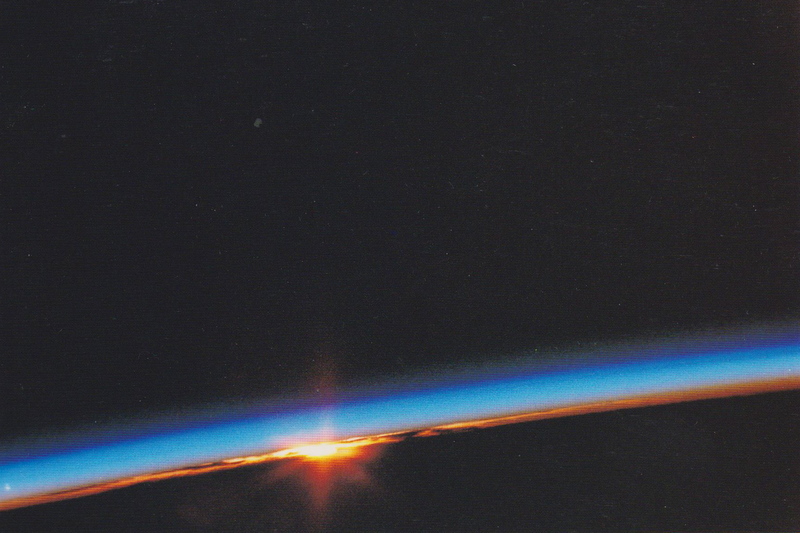 Take time to share something of that experience by watching The Overview Effect. Watch out for the thin band around the earth – seen from space the narrow band of our atmosphere is striking, even shocking, and gives a new perspective on the critical need to care for this ‘limited’ band so vital for all life on the planet to flourish. Consider the following comments from the Overview Institute. Recognising the reality of Cognitive Dissonance. I believe that the difference between how the planet appears from orbit and the moon and how it appears on the surface has created a form of collective “cognitive dissonance” in our species. For half-a-century, we have lived with the experience of who we really are and where we are in the universe, as contrasted with our daily behavior. We are one species with one destiny, part of the whole system we call Earth. However, our behavior is that of several billion parts, often in conflict with one another. To some extent, this is discouraging, but there are positive signs when we consider the definition of cognitive dissonance. According to changingminds.org, it is “…the feeling of uncomfortable tension which comes from holding two conflicting thoughts in the mind at the same time.” According to the same source, cognitive dissonance can be a great motivator, because it is stressful to have this tension continue, so we have to change our behavior or justify our behavior by changing the cognition (or adding new ones). In the case of the Overview Effect, it will be difficult to “change the cognition,” which has been experienced by so many space travelers and even by surface dwellers who have seen pictures or videos of the Earth from a distance. It is hard to suggest that the serene loveliness of our planet is not a reality. I hope that we will embrace this reality and our behavior will continue to change so that we will become an increasingly peaceful and ecologically aware species, especially as more people experience the Overview Effect. by Kevin W Kelley for the Association of Space Explorers.